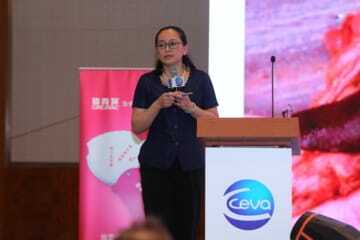 Mr. Harry Picard, Ceva China General Manager and Mr. Zhao Yang, Ceva China Swine BU Director expressed there warm welcome to experts, scholars, distributors and customers and delivered a Welcome speech on behave of Ceva team. Professor Tanja Opriessnig from The Iowa State Univeristy and The University of Edinburgh, the world well known leading PCV2 scientist, shared her expertise about PCV2 disease and choice of vaccines. She provided the latest information on PCV2 genetic variation and the importance of vaccination on gilts/sows, boars and piglets. Professor Guihong Zhang from Southern China Agriculture University presented the recent updates of PCV2 and the vital role of vaccination in PCV2 control in China also emphasized the responsibility and importance of everyone to control and stop ASF spread under current circumstances. 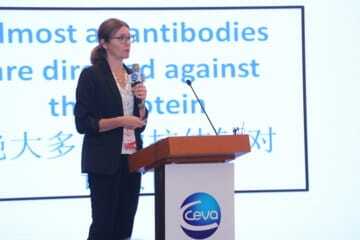 Wei Lu (Director, Swine Bio R&D Ceva-Biomune (US) & Ceva-Ebvac China), explained the method and criteria for PCV2 vaccine evaluation. He emphasis the importance of safety, purity, efficacy and potency for PCV2 vaccine of high-quality. Chong Yuan (Ceva China Technical Director) delivered his report entitled “Ceva PCV2 Management Solution”. In his report, a series of Ceva solutions for PCV2 control and prevention were emphasized, including clinical and lab monitoring and evaluation, biosecurity recommendation, Circovac vaccination and its corresponding immunization schedule and devices. We have 10 professors from the leading China Agriculture Universities including Prof Hanchun Yang, the leading swine disease expert and MOA chief advisor from China Agriculture University and Dr Changming Liu, the China leading PCV2 scientist, from Harbing Veterinarian Research Institute attending the KOL summit. KOLs had fierce discussion on how to evaluate the PCV2 vaccine efficacy and how to conduct the trials to evaluate vaccines. Viremia and qPCR are emphasized as the important indicator and means to fairly evaluate the vaccine efficacy instead of solely evaluating the pig performance in the end of cycle, which will be affected by many enteral factors. In the meantime, around 130 customers were invited to participate the PCV2 seminar; while in the meantime, we had 100,000 views to our online live broadcasting. According to media, it is estimated that around 7,000 people watched this program at different time points. Please visit Ceva China, for more China news update.